Old Town Alexandria is a quaint historic town in Northern Virginia just on the other side of the Potomac River from Washington, DC. It is a wonderful place to visit and an especially good destination to explore on foot. Dating back to 1749, Alexandria’s riverfront was an important colonial port during the colonial, Revolutionary, and Civil War periods. Today, Old Town is a revitalized waterfront with cobblestone streets, colonial houses and churches, museums, shops, and restaurants. This guide provides a self-guided walking tour and highlights the main historic sites. You can take the metro and get off at the King Street stop and walk about 10 blocks to the east. If you’d rather save your feet for your sightseeing tour, take the free trolley or a DASH bus for a dollar. To drive to Old Town, take the George Washington Memorial Parkway to East King Street. There are parking meters on the street and plenty of parking garages in the area. This is a busy tourist area, so start out early and plan to spend several hours exploring, shopping and enjoying a meal. A Note About Guided Tours: There are a variety of fun guided tours of Old Town Alexandria available including cruises on the Potomac River, horse-drawn carriage rides, ghost tours, and historic walking tours. 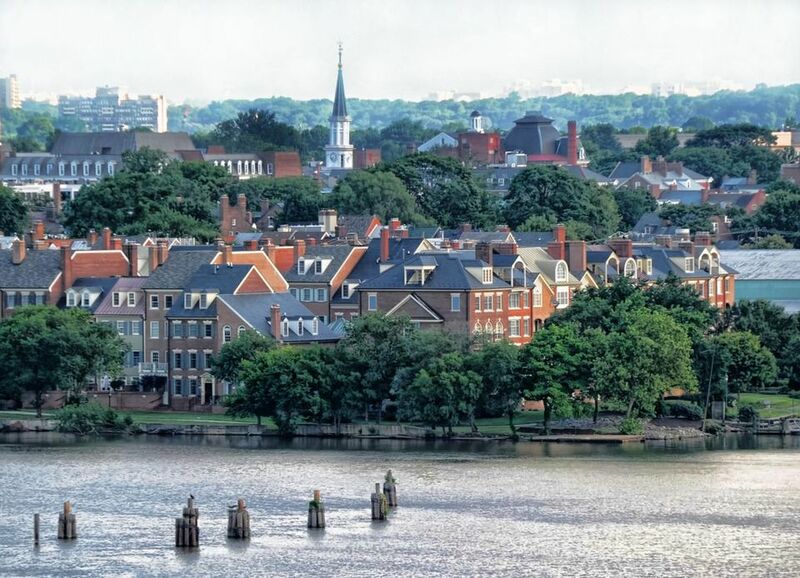 Begin your walking tour of Old Town Alexandria at the Ramsay House Visitor Center (221 King Street, Alexandria, VA) at the corner of King and Fairfax Streets. Pick up a map and some brochures of the many museums and businesses in the area. Ramsay House is a historic home, located in the heart of the Old Town Alexandria Historic District that is used as the city's visitor center. It is open daily from 10 a.m.-5 p.m. The staff is friendly and this is a good place to ask questions about local amenities. Head north on Fairfax Street and turn left on Cameron until you come to the redbrick buildings across Royal Street, known as Gadsby's Tavern Museum (134 North Royal Street, Alexandria, Virginia) Gadsby’s is an Early American-style restaurant and a museum of 18th-century antiques. George and Martha Washington, Thomas Jefferson and John Adams had temporary quarters here. The buildings are noted for their exquisite Georgian architecture, preserved and restored to a late 18th-century appearance. You can take a 30-minute guided tour of Gadsby’s or come back here later for lunch or a snack. Continue west on Cameron Street and turn right on St. Asaph Street. You will cross Princess Street. The cobble paving stones are original and traffic is banned here. Go one block farther on St. Asaph, and turn left at Oronoco Street. The house on your right at number 607 was The Boyhood Home of Robert E. Lee, a commanding general of the Confederate forces during the American Civil War. The property is now a private residence, located in the heart of Old Town Alexandria. Across Oronoco Street, at the corner of Washington, is the Lee-Fendall House Museum and Garden (614 Oronoco Street, Alexandria, Virginia), the home of several generations of Lees. You can take a brief tour of the home and see a display of Lee family documents, among which is the original copy of Harry Lee’s eulogy of George Washington. The Lee-Fendall House Museum exhibits portraits, jewelry, documents, letters, and books from the 19th century. Tours are given on the hour throughout the day. The garden is open to the public during the museum’s normal hours. It may be visited without purchasing a ticket. Continue on Washington Street and you will come to the Lyceum (201 S. Washington Street. Alexandria, Virginia), a Greek Revival building that was constructed in 1834 and now serves as Old Town's historical museum. This free museum displays more than 1,500 objects from 1749 through the present day. The Lyceum offers school programs, lectures and concerts, volunteer opportunities, and space for rental functions for the community. Continue walking east to Prince Street and turn left on Fairfax Street to the Stabler-Leadbeater Apothecary Museum (105-107 S. Fairfax Street Alexandria, Virginia) which displays a collection of early medical supplies and hand-blown glass containers. The museum is listed in the National Register of Historic Places and is one of Alexandria’s few preserved commercial establishments, possessing an original collection in its original location. Head south on Fairfax Street to Duke Street to the Old Presbyterian Meeting House (323 South Fairfax Street, Alexandria, Virginia). Founded in 1772, the Old Presbyterian Meeting House is a historic congregation with one thousand members, located in the heart of Old Town Alexandria. The graveyard here has a marker commemorating the Unknown Soldier of the Revolutionary War. Retrace your steps back to Prince Street and turn right. Cross Lee Street to Captain's Row. This is a cobblestone section of Prince Street that runs along the Potomac River. Stroll down to the waterfront park to see a view of the river. Alexandria is a scenic destination with views of National Harbor and the Washington Monument just on the horizon. Waterfront activities include biking, boating, outdoor dining, picnicking, and more. Continue north on Union Street. You will come to the Torpedo Factory (105 North Union Street, Alexandria, Virginia). Torpedoes were manufactured here during World War I and II. Today, the building houses the studios of about 160 artists. You can watch printmakers, jewelry makers, sculptors, photographers, painters and potters at work. This popular attraction is a great place to find unique gifts and decorative items for your home. Courtesy of Virginia Tourism Corp.
Head west to King Street where you will find a wide variety of shops and restaurants. This is the main thoroughfare in Historic Alexandria and is a great place to spend a few hours browsing among the unique stores. Old Town Alexandria is a prime shopping destination and home to dozens of privately owned boutiques. Read more about shopping in Alexandria. Old Town has a wide variety of restaurants from family-friendly sandwich shops to elegant fine dining. See a guide to the best restaurants in Alexandria. During the warmer months of the year, It is especially nice to dine outdoors. There are plenty of Alexandria restaurants with outdoor seating.